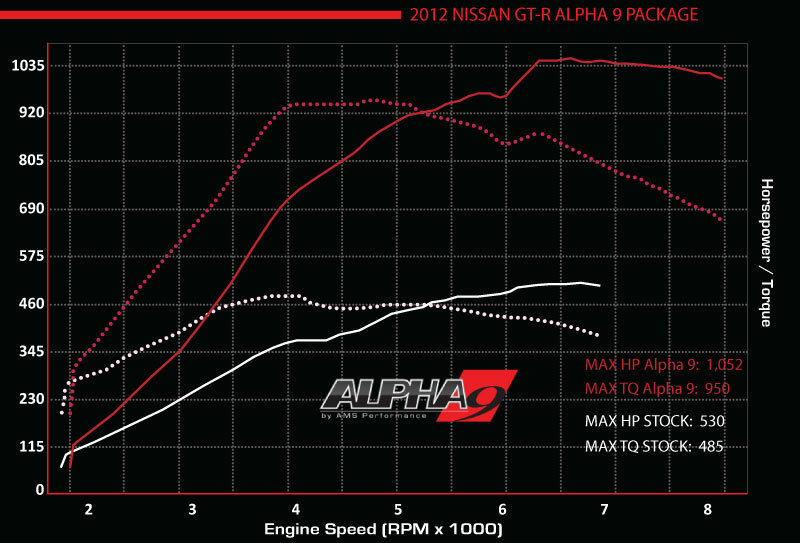 The Alpha 9 package for your Nissan GT-R offers the most reliable bolt-on horsepower available, and the continued "testing"(abuse) that the Alpha 9 GT-R car has gone through proves it. The Alpha 9 package offers stock-like turbo spool up and drivability while boosting power output to a staggering 1050+ horsepower on race gas and 950+ horsepower on pump. The Alpha 9 package has more achievements than any other package available, and even holds the stock manifold turbo upgrade record for the 1/4 mile. Elephant in the room, with another high HP, AWD turbo'd car? Not even. As you lay into the throttle, a smooth burst of speed plants you firmly in your seat and pulls strong throughout the entire rev-range. There is no added turbo lag or drama, just pure, explosive acceleration unlike anything else before it. The Alpha 9 package for your GTR is so quick, it out-accelerates the 1000hp Bugatti Veyron all the way to 130+ mph on regular pump gas. Motortrend magazine reported that the Alpha 9 GT-R was the quickest car they have ever tested! The Alpha 9 test GTR has been through more abuse than most owners will ever submit their GT-R to. The Alpha 9 GTR has been tested by Edmuds, Motortrend and Modified magazine-all with rave reviews. Countless full-blast acceleration tests have been done by every reviewer, along with 100+ degree heat runs made by Motortrend for 1 mile flat-out runs. Short acceleration bursts are fun, but what better way to show Alpha's reliablility than by running flat-out for a mile? The Alpha 9 GTR pulled off a 205.3mph run! At the heart of the Alpha 9 Package are custom AMS billet wheel ball-bearing turbo's. The two units provide enormous gains in hp and tq without turbo lag. Its a complete win-win situation that is unheard of in the industry provided by the latest in turbo technology. The AMS turbos are the same race-proven turbo's used by professional race organizations such as Forged Performance and Brass Monkey Racing. On race fuel the Alpha 9 puts out over 420hp more than a stock GT-R. With an Alpha 9 GT-R, you are truly in a league of your own.